Fragmentation is a critical mechanism for the calculation of the trajectories of the blocks and the impact energies, for the assessment of the potential damage and for the design of protec-tive structures, although few rockfall models account for it. In this contribution we present an application of the trajectory simulation tool RockGIS, which explicitly accounts for fragmen-tation, to a recent rockfall event occurred near Vilanova de Banat (Spain). All parameters of the model controlling the kinematics of the propagation and fragmentation have been calibrat-ed in order to reproduce the number of fragments generated and trajectories followed by the blocks. Several performance criteria have been considered and simulations with and without accounting for fragmentation have been performed to assess their influence. The results con-sidering fragmentation show a reasonable matching with the observations in the field. 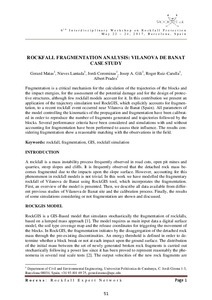 Matas, G., Lantada, N., Corominas, J., Gili, J., Ruiz, R., Prades, A. Rockfall fragmentation analysis: Vilanova de Banat case study. A: Interdisciplinary Workshop on Rockfall Protection. "6th Interdisciplinary Workshop on Rockfall Protection: RocExs 2017: Barcelona, Spain, 22-24 May, 2017". Barcelona: Centre Internacional de Mètodes Numèrics en Enginyeria (CIMNE), 2017, p. 51-54.